Guitar tablature makes it easy for guitar players to read songs without having to understand standard music notation. Tablature (TAB) is a system for writing and reading music that’s more logical for musicians who play stringed instruments. While TAB is most often associated with guitar players, mandolin, ukulele, banjo, and other stringed-instrument players can use the same basic system for their own instruments. While tab is typically easier to read and understand than traditional notation, songs written in tab can be fully and accurately written down or simplified. For beginning players, sticking with a stripped down version of complex songs might be the best approach. Easy guitar tabs for beginners are usually just that—stripped down versions. A stripped down tab version of a song still gives you enough information to play a song so it’s recognizable to anyone who hears you play it, but it usually omit very advanced licks entirely or at least presents them with only the necessary elements to make them recognizable. This lets you play the basic melodic and harmonic elements of the song without overwhelming you with extraneous information. Here is an example of an easy guitar tab for beginners. 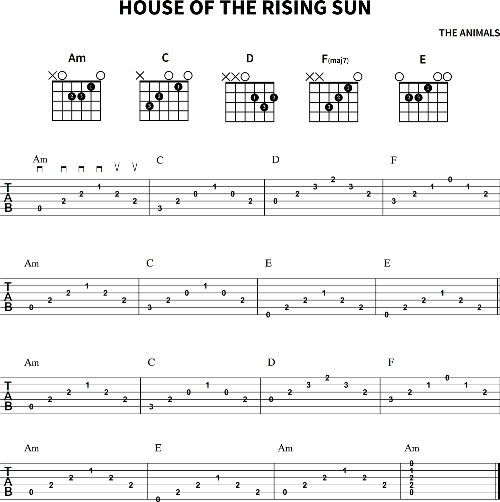 The song is “House of the Rising Sun” and this tab sets forth a simple picking pattern built around the highly recognizable melody. The chords are indicated a well. With a little practice, a beginner could play this song with conviction. Some popular easy guitar tabs for beginners are arrangements found on the Internet or in printed music books. These include easy versions of “Hotel California” by the Eagles, “Night Moves” by Bob Seger, “Wonderful Tonight” by Eric Clapton, and “Maggie May” by Rod Stewart. Traditional folk songs and holiday songs are also frequently tabbed for beginning guitar players and can be found with a simple Internet search. Easy guitar tabs are perfect for beginners or for people who just want to play guitar to entertain themselves, with no intention of becoming a virtuoso. If this sounds like you, there are plenty of easy tabs to get you started.